I closed out NYFW with Calvin Luo. His show was amazing and it was at the Whitney Museum which I had never been to while I lived in New York. 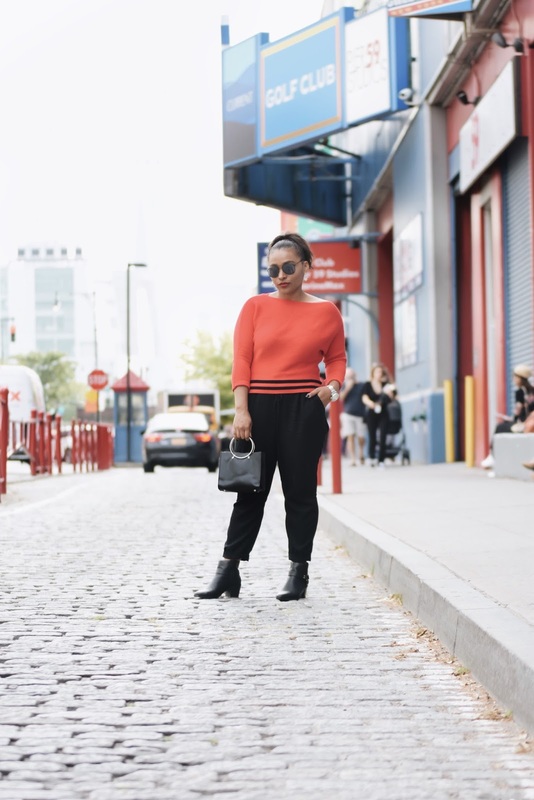 My last NYFW look consisted of black loose pants and a red sweater with booties for a chic grungy look. This look was not planned but something I put together last minute with whatever I had left in my suitcase after living in NY for a week. I was happy to experience my last show with my partner crime. We had one hell of a week and we were happy to close it out together. Calvin Luo was one of the youngest designers this season showcasing his beautiful designs. The collection was a nice mix of 70s, 90s, and today's trends. He also had a few models come out on skateboards which were pretty cool and fit the theme. The best part of the show for me was at the end when Luo himself came out after the final walk and he locked eyes with his proud parents in the front row which sat across from me and they looked at him with such love. My heart literally melted when I saw that because it's a beautiful thing when your parents fully support a passion of yours. That's a wrap on NYFW Spring/Summer 2018! I had so much fun with my partner and crime and enjoyed so many shows by some talented designers. That you to all the designers for inviting me this season. If you haven't read my prior posts for this season you can catch them here. Thank you for following along. Love you guys!